Cricket Australia also stated that each player must also complete 100 hours of community service before being considered for future selection. 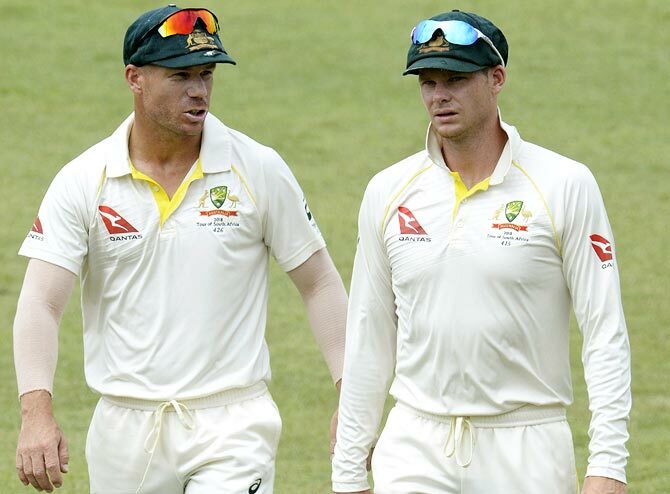 Sacked Australia captain Steve Smith and David Warner have both been banned for 12 months for their roles in the ball-tampering scandal in Cape Town, Cricket Australia (CA) announced on Wednesday, after uncovering a web of lies told by the players after they were caught. Opening batsman Cameron Bancroft was banned for nine months following the scandal, which has outraged the fans, jolted the sponsors and prompted CA to send the trio home from South Africa. The trio will be allowed to compete in club cricket, but cannot take part in state or international games for the duration of their bans. "David Warner will not be considered for team leadership positions in the future," CA said in the statement, having fingered him in developing the plot. Smith and Bancroft will have to wait two years before they are considered for leadership roles, and even then it will "be conditional on acceptance by fans and the public", according to CA. Each player must also complete 100 hours of community service before being considered for future selection, while it was confirmed that the cheat had been confined to the trio only, exonerating team mates and coach Darren Lehmann of any wrong-doing. A key finding was that Bancroft had in fact used sandpaper to rough up the ball in the third Test at Newlands, and not sticky tape as he stated, adding an extra element of premeditation to the actions and re-opening questions as to whether this was an isolated incident. Warner was also found guilty of "provision of advice to a junior player (Bancroft) regarding how a ball could be artificially altered including demonstrating how it could be done". Part of the findings against both Smith and Bancroft were that they had mislead both the umpires on the field of play, and the public in a press conference as to the "the nature, extent and participants of the plan". While Smith and Bancroft were both found guilty of "knowledge" of the plan to cheat, a CA statement credits Warner with the "development" of the plot, suggesting he was the instigator. All three also have the right to appeal their sentences. "The CA Board understands and shares the anger of fans and the broader Australian community about these events," Cricket Australia Chairman, David Peever said in a statement. "They go to the integrity and reputation of Australian Cricket and Australian sport and the penalties must reflect that. "These are significant penalties for professional players and the Board does not impose them lightly. It is hoped that following a period of suspension, the players will be able to return to playing the game they love and eventually rebuild their careers." Smith and Warner have also been stood down from their Indian Premier League (IPL) teams for 2018, representing a significant loss of income after the Rajasthan Royals and Sunrisers Hyderabad had paid $1.84-million respectively for their services. "First, we waited for ICC's (International Cricket Council) decision, after that Cricket Australia's and then we decided on the matter," IPL chairman Rajeev Shukla told reporters. "We have decided to bar them from this season. The replacements will be made available to the two teams. We did not take any decision in haste, it was a well thought-out decision." There is more financial fallout possible with multinational electronics company LG having already said they will not renew a sponsorship with Warner, while several other partners of Cricket Australia are reviewing their positions in light of the embarrassing scandal. The players will be available for the World Cup in England and Wales that starts on May 30 next year, as well as the Ashes series later in the English summer. The trio will be replaced for the fourth and final Test at The Wanderers in Johannesburg by opening batsmen Matthew Renshaw and Joe Burns, as well as all-rounder Glenn Maxwell. South Africa lead what has been a tempestuous series 2-1 having not enjoyed a home test series success against the Australians since 1970.